Just Because It’s Been a While…. It’s inevitable that when a person takes too many pictures of their dogs, that one day, once they have been blogging, that person will blog about those said dogs. I have two dogs. Miles, the lab mix – not pictured – is my first dog. He’s a crotchety, stubborn old dog that barks for the sake of barking, but is great with our daughter and will mostly sit at our feet and does not whine unless he really, really has to go. Crotchetiness and random barking aside, he’s a pretty well-behaved dog. Oh, and he sometimes jumps on visitors and begs for food, but he’s better behaved than that dog, Marley. 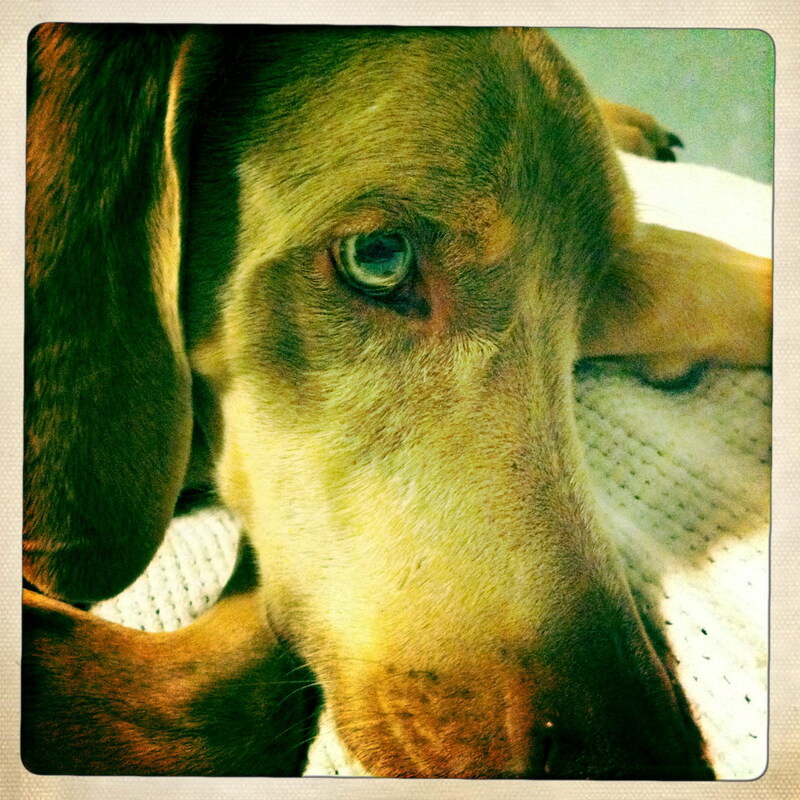 Hemingway, our Weimaraner, is a different story. He whines. He barks, loud, deep barks that scare people. Really. He even barks at me when there is a fence separating us. I like to think it’s because the physical separation of the chain link fence is too much for him. People think he’s vicious – if they only knew that really he’s a big scaredy cat that will jump when he hears a cricket chirp. He eats everything within his reach. He wants to lay on top of you or right up next to you even if that means you are on the very edge of the bed. Did I mention, he weighs 70+ lbs? He is hungry all the time. He has high anxiety and he has never really taken to our daughter. But, I still love him. I have seriously contemplated giving him away – like when he starts barking during nap time or when he’s whining a 5 am because he wants to go out, but as soon as he goes out he wants to come back in. Yes, this is Hemingway, Hemi, Hemers. Isn’t he lovely? And yes, this picture was taken of him on our bed. Don’t tell my husband. Did I mention that he barked the last 30 minutes of our 5 1/2 hour road trip this past week? Loud, deep, barking. Why was he barking? Who knows, maybe because he wanted to sit in our laps or because that road trip usually only takes 5 hours and since he can’t use his words and say repeatedly, “Are we there yet?”, he decided to bark. He almost found a new home just outside of Boerne, TX. Not really. I would never give him away. Look at that picture, how could I ever give this dog away? I also hear he suffers from bouts of explosive diarrhea. That’s a dirty rumor. All I can say is that only a true friend would know about that.